Director Davis Guggenheim’s new documentary love letter to the electric guitar, “It Might Get Loud,” is loaded with unbelievable moments. First, he manages to shoot Led Zeppelin guitarist Jimmy Page’s visit to Headley Grange, the East Hampshire, England, home studio where the band recorded “Led Zeppelin IV.” Page is regal in his puffy, white shirt and black duster, gliding over the grounds, strumming his mandolin in the garden, and recounting tales of recording John Bonham’s legendary, massive backbeat on “When The Levee Breaks.” He relaxes and opens up for Guggenheim in an unprecedented manner (explained, perhaps, by his Associate Producer credit, but still). Next, Guggenheim joins U2 guitarist, The Edge, as he retraces his childhood steps through Mount Temple Comprehensive School in Dublin where the fledgling guitarist pulled Larry Mullen, Jr’s “Seeking Musicians” notice off of a school board thereby delivering U2 unto the world. Then he and The Edge pour over early “Joshua Tree” demos in the guitarist’s home studio. There’s even a cool scene where White Stripe Jack White builds a diddley bow, rudimentary, single-stringed instrument that birthed the slide guitar and figures prominently into the blues. “Who says you need a guitar,” he says, exhaling acrid cigarette smoke. 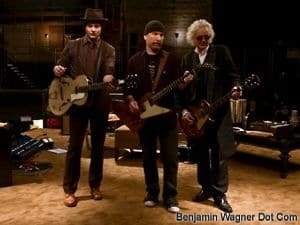 Guggenheim’s coup de grâce, though, is a moment in the film’s contrived-but-compelling through line: a guitar “summit” featuring Page, Edge and White on a Warner Bros. backlot soundstage. The three disparate players spend some time feeling one another out in conversation, before finally grabbing their guitars and swapping tricks, tips and tunes. In one goose bump-inspiring moment, Page shows Edge and White his “Whole Lotta Love” riff. The corners of White’s mouth — typically reserved for frowns and scowles — turn upward into a wistful, childish grin, while Edge squints his eyes in apparent disbelief, then leans in closer before seconding the progression. I conducted a brief phone interview with Davis Guggenheim when he premiered his “An Inconvenient Truth” at Sundance. Months later, I called him on his cell phone seconds after he accepted his Oscar for the film. I didn’t mention either today as I ushered him from the Paramount Screening Room to the MTV Newsroom. (Or that I too interviewed The Edge a few years ago, and thought he had small, soft hands.) I did, however, spend our twenty-six floor elevator ride discussing the thread that starts with Led Zeppelin, U2, White Stripes, Green Day and Silversun Pickups: distortion, swagger, and commitment. I may know the answer to those questions, but I may never know what would have happened had I totally committed (or “sold my soul,” as Robert Johnson might say) to rock ‘n roll. Instead, I’ll have to settle for also ran status, an asterisk on an asterisk with a footnote. You may be an “asterisk on an asterisk with a footnote.” But your music still rocks. And at the end of the day, isn’t that what REALLY matters? i echo bob. i would rather listen to an “asterisk on an asterisk with a footnote” over 99.9% of the crap that is out there. you are earnest in your commitment to write and record music that matters to YOU. that you’ve found an audience (regardless of size) doing something you love, is the definition of success, my friend. For what it’s worth, I had your music in rotation with Pete Yorn, Jack Johnson and Aimee Mann on my ipod last week. No U2. awesome company all, and it’s worth a lot. thanks erin (and tricia and bob)! with more than 15% AHA over the counter or is it only by prescription? Every body acknowledges that modern life seems to be not cheap, but people need money for various things and not every man earns enough money. Hence to receive good personal loans or just auto loan would be good solution. Awesome webpage. I never noticed http://www.benjaminwagner.com before in my searches! Cool efforts! I’m new here and I am sorry if this is not the right place for this message.